Swedish Angel Chimes and Christmas Candles. Add the finishing touches to your Christmas decorations and create the perfect ambience with the warm glow from the candle and the gentle chimes from the carousel with one of our beautiful Swedish chimes. The Silver Angel Carousel is a nostalgic Christmas angel oversized tealight candle holder made with silver coloured nickel-plated steel. As the candle flame heats the carousel the Angels start to spin. There are other styles and colours available including the father Christmas themed Silver Christmas Star Carousel, as the carousel spins Santa’s sleigh and the reindeer spin around, the carousel is finished of beautifully with a traditional Christmas Star on the top. Add a little bit of magic to your Christmas display with the gentle chimes on the Swedish Christmas Chimes at TAOS Gifts with the beautiful swedish Chimes with 4 small candles to create an ambient glow while they heat the carousel, as it spins the chimes ring gently as they hit the little bell creating a subtle ding ding sound. Watch the reindeer pull Father Christmas and his Sleigh around and around with gentle chimes on the Silver Father Christmas Chimes or watch as the Angels spin round and around on the original Swedish Angel Chimes Carousel. The Swedish Chimes are also available in a brass effect so you can mix and match to suit your colour scheme. Replacement candles are available in handy packs of 20 in red, green, ivory and white. Made by Shearer Candles, they burn for up to 2 hours. Shearer Candles also have a wide range of luxury scented candles ideal to give as Christmas gifts or to use at home to fill the home with seasonal scents. Frankincense & Myrrh is a rich Arabian fragrance combining the oils of precious woods, spices, musk and vanilla, this triple wick candle comes in a stylish heavyweight glass jar and a decorative gift box and has up to 40 hours of burn time. stunning gold triple wick glass jar it adds glamour and decadence to your home or office. Enjoy the rich and fruity scent of Oriental fig blended with warm festive spices with Shearer Candles Winter Fig, the deep purple pillar candle gives you up to 85 hours of aromatic luxury! Shearer Candles are made with quality waxes and oils to create the long-lasting fragrances. We stock Shearer Candles hand poured scented candles in Spring Couture, Victorian Winter, Tropical Spa, Delice Aroma, On The Terrace and Highland Collection ranges, and they are available in a huge selection of filled tins, jars, glasses, tapers, pillars, votives, floating candles and tealights. Ideal gifts and finishing touches to your home decor there are colours, styles and scents to suit all tastes! Comfort Candles are a unique line of attractive candles with inspirational sayings. They come packaged in a beautiful gift box which is ready to give. These versatile candles hold a tealight (included) and include a fashionable copper lid. With the lid on or off any of the Comfort Candles will make a great gift for someone special and are a great home accessory. Comfort Candles have a beautiful range designed especially for Christmas, each is supplied in a delightful “Ready to Give” Christmas presentation gift box containing a Christmas candle holder, tealight, hanging tasselled Christmas decoration and musical Christmas Gift Card. Comfort Candles are hand coloured ceramic candle holders with a stone look in warm Tuscan shades of ochre and ivory. The Family Comfort Candle Christmas gift set reads “Let Peace be with you on Christmas and always” on the tealight holder and “Families share the spirit of the Holidays” on the tasselled Christmas Tree window decoration. For Friends there is the stylish Friendship Christmas Candle with the same Peace message on the tealight holder “Let Peace be with you Christmas and always” and the tree, Window decoration has the words “Friendship warms the heart at Christmas!. A beautiful gift for friends this Christmas. For that very special someone this Christmas there is a sentimental message for them to, a gift to cherish, the Someone Special Christmas Comfort Candle has the words “May the Holiday Season….warm your Heart” inscribed on the tealight holder, and the decorative card reads “You are Someone Special to me”. There are many other Comfort Candles available, all with beautiful messages, or words of comfort to give as gifts for any occasion, with their stylish designs they’ll suit all tastes. At TAOS Gifts we have beautiful additional tea light candles with a difference, the Faerie Flames Tealights burn with a colourful flame! Choose either red, or green for a white tealight candle that burns with a colourful, unusual flame! Amaze your friends and family as the flame glows. Ideal for dinner parties or relaxing baths. Safe for use in tealight holders and burners. For best effect wait a couple of minutes for the colour to develop, and turn out the lights! The Faerie Flames Tealights are perfect additional gifts to give alongside the beautiful Christmas Comfort Candles. At TAOS Gifts we have a beautiful range of novelty, stylish and aromatic candle gifts for Christmas, Birthdays and everything in between. Gleneagles Studio, Edinburgh produce beautiful, collectable figurines and gifts, the antique collection are stunning resin figures and ornaments that have been carefully hand painted to give them the distressed look of hard wood, with an antique silver finish. The Laughing or Happy Buddha features in this collection in various poses and is presented in a gift box. The Laughing Buddha is considered lucky, and to bring good fortune. At TAOS Gifts we have various Buddha figures in stock, Joy is approx 8cm tall, a very happy looking laughing Buddha. We also have a Buddha version of Hear No Evil, See No Evil and Speak No Evil. Hear No Evil shows the Laughing Buddha with his hands over his ears, and such a big smile it’s easy to imagine him giving a hearty chuckle. See No Evil shows the Laughing Buddha with his hands playfully covering his eyes. Speak no Evil shows the Happy Buddha covering his mouth with both hands, but his eyes give away the fact he’s still laughing under his hands. The taller Laughing Buddha figure shows Buddha walking, he stands just over 14cm tall. Prosperity is another laughing Buddha standing at just over 22cm, beside him is a little plate for a Tea Light candle, a stylish addition to any home. The Beautiful Amulets compliment the Buddhas perfectly, with the matching dark wood and Antique silver effect finish you can carry the antique theme through the home with the matching Wall Art Bust, The Meditation Incense holder and ash catcher, the elegant Meditation Tea Light Holder Amulet, and Contemplation, a beautiful Tea Light with a glass bowl. Bonita, meaning beautiful is the perfect name for this collection of glass giftware. Bring Summer into your home all year round with the bright floral designs, dainty crackled glass tealight holders with matching glass lids and a decorative floral tea light. Beautifully hand painted and supplied in attractive gift boxes they are pefect gifts for loved ones to brighten up the home or office. 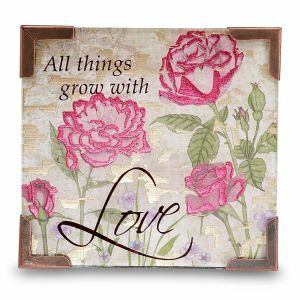 Also from the Bonita collection are sentimental glass plaque fridge magnets with inspiring words, they come with a built-in stand and strong magnetic holder so they can be displayed on the fridge or other metallic surfaces. Gilt-edged corners with a pretty floral picture etched in glass, these also come supplied in an attractive gift box.